At first blush, one might think that the Democrats have a decent chance of taking control of the Senate in the 2018 midterm. After all, midterms frequently break against the president's party, which has lost an average of four seats in the 26 midterms conducted in the era of popular Senate elections (starting with the 1914 midterm). Democrats only need to win three net seats to flip their current 52-48 deficit into a 51-49 majority, a gain that would be in keeping with the average midterm performance. Additionally, midterm elections often end up becoming a negative referendum on the president, particularly if he is unpopular or the country is undergoing some sort of trauma, economic or otherwise. It's too soon to say what the public will think of President Trump in November 2018: His early approval rating is historically weak 1 for a new president, and there have been a record number of controversies for the first month of a modern presidency. Still, there's no way of knowing what his standing will be and what will be on the mind of the electorate more than a year and a half from now. Note: This includes the 33 Senate elections regularly scheduled for 2018 along with a special election in Alabama, which was necessitated by former Sen. Jeff Sessions' (R-AL) recent confirmation as U.S. Attorney General. Gov. Robert Bentley (R-AL) appointed state Attorney General Luther Strange (R) to the seat. He will try to win the remainder of Sessions' unexpired term in 2018 (and then, if he succeeds, presumably run for election to a full term in 2020). So there are conflicting forces at play in 2018. On one hand, the party that does not hold the White House often benefits from the midterm environment. History suggests that the Republicans' dream of netting eight seats next year, thus creating a filibuster-proof 60-seat majority, is unlikely, even though they have many credible targets. On the other hand, the Senate map is so daunting for Democrats that just not losing any seats will require an enormous amount of effort and luck. Before getting into the specific ratings, it's worth noting that no senator has retired as of yet (other than Sessions, who in any event was not up for reelection this cycle). This is important because four out of five senators who have sought reelection in the post-World War II period have won another term 2. The most obvious retirement possibilities heading into this cycle were Sens. Dianne Feinstein (D-CA) and Orrin Hatch (R-UT), but both may end up running for reelection anyway. Sen. Tom Carper (D-DE) is another potential retiree, but in either California or Delaware a Democrat would be heavily favored to hold an open seat (and a Republican would be heavily favored in Utah). There's always the possibility of a surprise retirement or resignation shaking up the playing field, though. Any discussion of 2018's Senate races have to start with the five Democratic incumbents who hold seats in states that Trump won by at least 18 points apiece last year: Sens. Joe Donnelly (D-IN), Claire McCaskill (D-MO), Jon Tester (D-MT), Heidi Heitkamp (D-ND), and Joe Manchin (D-WV). These are the five top targets for the Republicans next year, although we see some subtle differences among this quintet of red state Democrats that prompt us to split them into two groups. While one could argue that all five should be Toss-ups, we're giving two of the incumbents an early edge and starting them as Leans Democratic in our ratings: Manchin and Tester. The once-dominant West Virginia Democratic Party is fading fast. As recently as 2010, the party held every statewide elected executive office, both chambers of the state legislature, two of three U.S. House seats, and both Senate seats. Since then, they've lost all of those except the governorship, state treasurer, and Manchin's Senate seat. Yet Manchin has demonstrated significant crossover appeal -- he won by 24 points in 2012 even as Barack Obama was losing statewide by 27 points -- and Gov. Jim Justice's (D) seven-point open-seat gubernatorial victory last year even as Trump was carrying the state by an astounding 42 points shows that Mountain State voters are still willing to split their tickets in some instances. Tester, meanwhile, has benefited from Trump's nomination of Rep. Ryan Zinke (R) as secretary of the interior. Many viewed Zinke, who represents the Big Sky Country's lone House seat, as Tester's most formidable potential challenger. Tester, a two-term incumbent, has never gotten a majority of the vote but has been helped by Libertarian candidates pulling votes from his GOP opponents. The next tier of Republican targets is rated, like Montana and West Virginia, as Leans Democratic. Sens. Bill Nelson (D-FL), Sherrod Brown (D-OH), and Tammy Baldwin (D-WI) all get the benefit of the doubt. Baldwin is probably the most vulnerable just because she's only won statewide once (while Nelson and Brown have won several times) and because her political persona probably doesn't fit the state quite as well as the other two. However, Nelson and Brown seem likely to face opponents with whom political watchers are familiar: Gov. Rick Scott (R-FL) and state Treasurer Josh Mandel (R-OH). Both Scott and Mandel are term-limited in their current jobs and have been telegraphing Senate runs for some time (in fact, Mandel arguably never stopped running for Senate after losing to Brown in 2012). Each will assuredly be well-funded although they have question marks too: Scott's two election victories were razor-thin, and he's never been particularly popular, while Mandel underperformed Mitt Romney's Ohio showing in 2012 and lagged a little bit behind the statewide ticket in his 2014 reelection (he still won easily). In any event, all of these races could be highly competitive next year. Also in this category, as Leans Independent, is Sen. Angus King (I-ME), who caucuses with the Democrats. There are many unknowns in the race: Will outgoing Gov. Paul LePage (R) challenge King? 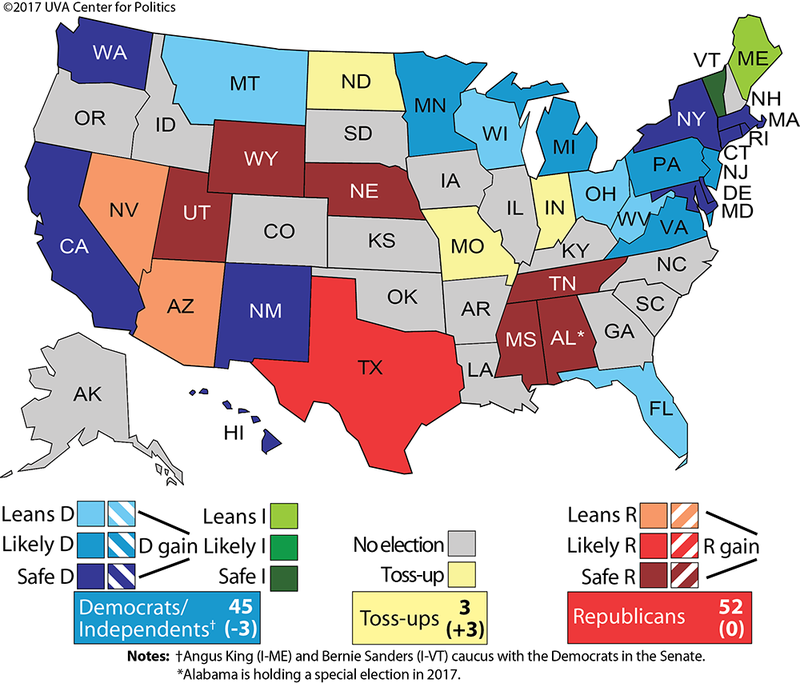 Will the Democrats nominate a credible candidate, potentially creating a true three-way race? And will the state's new instant-runoff voting system 3 actually be in place next year? Republican challenges to Sens. Debbie Stabenow (D-MI), Amy Klobuchar (D-MN), Bob Casey (D-PA), and Tim Kaine (D-VA) are probably longer shots. Trump won Michigan and Pennsylvania last year and came close in Minnesota, but the Senate incumbents in all three states each have won multiple statewide victories and ran ahead of Obama in 2012. Kaine's vice-presidential campaign, while not making much of a ripple nationally, probably contributed to Clinton running slightly ahead of Obama's 2012 margin in the Old Dominion. All four Democrats start as clear favorites at Likely Democratic. Sen. Robert Menendez (D-NJ) also starts in this category. New Jersey should be an easy hold for a Democratic incumbent, but Menendez is under federal indictment in a corruption case. Democrats probably would be better off if Menendez just called it quits, but at this point it appears that he will seek reelection and may not face any strong opposition in a primary. The other Democratic-held seats -- California, Connecticut, Delaware, Hawaii, Maryland, Massachusetts, New Mexico, New York, Rhode Island, and Washington -- all start as safe for the incumbent party. Sen. Bernie Sanders (I-VT) also starts in a very secure position. 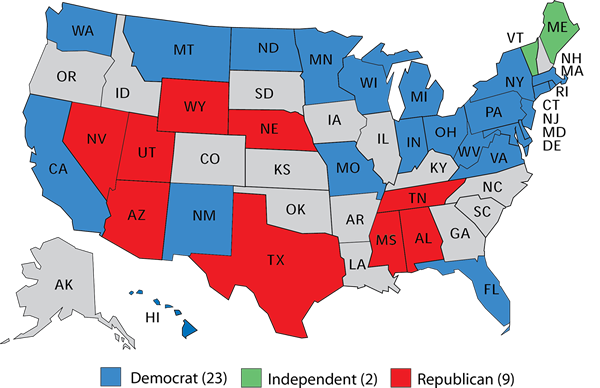 Of the nine Republican-controlled seats, six start as Safe Republican: Alabama, Mississippi, Nebraska, Tennessee, Utah, and Wyoming. 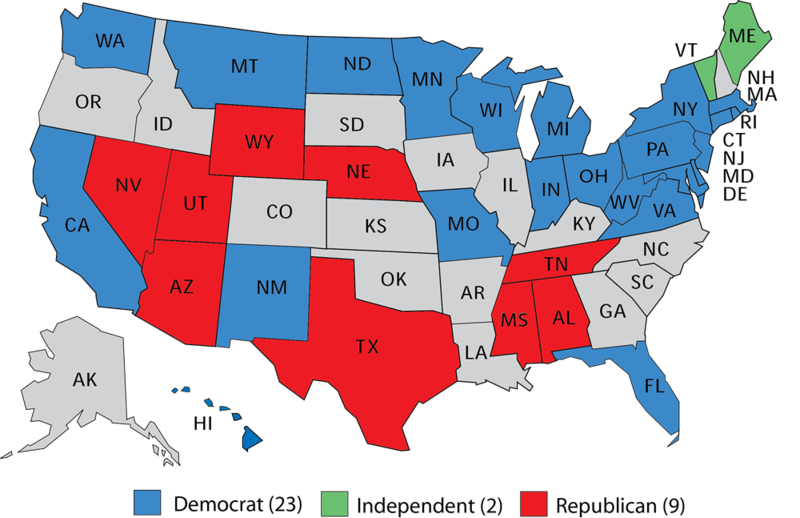 Most of these states haven't elected a Democratic senator in decades: The Cornhusker State is the lone one that has been represented by a Democrat in the Senate this century. If Democrats make any of these seats competitive it likely will mean that Republicans are having an awful midterm. Texas, where Sen. Ted Cruz (R) will be seeking a second* term, probably should also be listed as safe: The last Democrat to win a Senate race there was Lloyd Bentsen (D) way back in 1988 (he won reelection while also serving as Michael Dukakis' vice-presidential nominee). But the sometimes abrasive Cruz is not a perfect candidate, and there's a distant outside shot that Democrats could make the race competitive if the midterm environment is bad enough for Republicans, so we'll call it Likely Republican to start. Clinton significantly improved on Obama's 2012 margin in Texas, but she still lost the state by nine points. Realistically, there are only two credible Democratic targets in the Senate -- and that may be generous. Arizona is another state that hasn't elected a Democratic senator this century -- the last Democrat to win a Senate seat there was Dennis DeConcini, who won reelection in 1988. But the Grand Canyon State, like Texas, became more Democratic in 2016, and Clinton came within 3.5 points of carrying it. And Sen. Jeff Flake (R-AZ), who is running for a second term, has angered some Republicans with his criticism of President Trump. Flake might have primary trouble: Kelli Ward, a very conservative candidate who came within about a dozen points of Sen. John McCain (R-AZ) in a 2016 primary, is challenging Flake, and it's possible a more prominent challenger will enter the race, too (which could benefit Flake assuming there are multiple challengers splitting the anti-incumbent vote). A credible Democrat might possibly be favored in Arizona if Flake doesn't win renomination. If Flake is renominated, his vulnerability will be determined by the national environment and the degree of division within the state GOP. Sen. Dean Heller (R-NV) is a clearer Democratic target, but he starts as a narrow favorite while Silver State Democrats, who saw much of their bench wiped out in their disastrous 2014 midterm, cast about for a candidate. Nevertheless, expect Democrats to find someone who can plausibly make the race. And then they'll throw everything they've got at Heller, with so few other targets nationally. We did not dwell much on possible challengers to the incumbents listed above: There's plenty of time for that as the cycle develops. However, among the many candidates to watch are several members of the U.S. House. Possible Republican challengers to Democratic incumbents include Indiana Reps. Jim Banks, Luke Messer, and Todd Rokita; Michigan Rep. Fred Upton; Missouri Reps. Ann Wagner and Sam Graves; North Dakota Rep. Kevin Cramer; Ohio Rep. Pat Tiberi; Virginia Rep. Barbara Comstock; West Virginia Rep. Evan Jenkins; Wisconsin Rep. Sean Duffy; and perhaps many others. On the Democratic side, Arizona Rep. Kyrsten Sinema; Nevada Reps. Ruben Kihuen, Jacky Rosen, and Dina Titus; and Texas Reps. Joaquin Castro and Beto O'Rourke are also possibilities. For the most part, these House members have safe seats. So if a number of House Republicans jump into Senate races, it may be a sign that the party is feeling good about the midterms (and vice versa for the Democrats), because for most of these members a Senate race is riskier than running for reelection. As National Journal's Josh Kraushaar recently argued 4, the number of House Republicans who decide to step up in Senate races will be a good barometer of how the party feels about Trump's standing. A few House members have already passed on trying for the Senate: Zinke opted for a Cabinet spot over a Senate run, and Reps. Susan Brooks of Indiana, Pat Meehan of Pennsylvania, and Dave Brat of Virginia also have said no. The candidate recruiting season has probably a year or more to go: While it's become common for Senate candidates to announce their bids relatively early in the off-year before an election, there are plenty of examples of late-entering candidates who nonetheless won recent elections, such as Sens. Ron Johnson (R-WI) in 2010 and Cory Gardner (R-CO) in 2014, as well as Sen. Marco Rubio (R-FL), who made a last-minute decision to run for reelection last summer. Also, late retirements can change the landscape: then-Sen. Olympia Snowe's (R-ME) surprise decision to retire in 2012 opened the door to Angus King winning her Senate seat later that year. Given the uncertainty about President Trump's standing, there may be incentive for potential candidates to wait a little bit longer this time before taking the plunge, given how influential his approval rating is likely to be on the outcomes across the country next year. Hard to believe, isn't it? Everyone's still exhausted from the 2016 election, not to mention the first tumultuous month -- or has it been a year? -- of the Trump Administration. Yet here we are with another campaign barely underground, soon to spring forth like May flowers. For better or worse, that's the way our system works. *Correction: A previous version of this article misstated the number of terms Ted Cruz has served in the Senate. He is in his first term and is seeking a second.